Instagram is probably the most popular photo sharing platform in the world, which is why it comes as no surprise that photographers of levels of experience use it frequently, but the photo editing options Instagram offers are still somewhat limited. 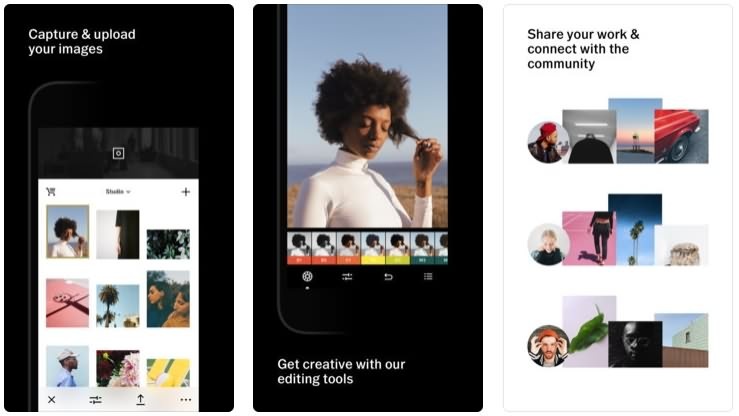 Luckily, there are so many other photo editing apps for Android and iPhone devices which allow us to enhance colors, crop images and increase or decrease the level of clarity in a photo that can be used to edit photos before you share them on Instagram. Photo editing is an integral part of the photographic process, and in this article, we are going to take you on a journey through the best photo editing apps currently available that will make your photos look like a masterpiece. Powtoon is an awesome video creation platform that enables anyone to create professional-looking and engaging videos and presentations in minutes, without any design or technical skills. Enjoy your exclusive 15% on annual plans now! If you are looking for an easy to use app that offers professional photo editing features, you should look no further. Snapseed is equipped with tools that will allow you to enhance colors, make your selfies more attractive or even remove people you don't like from your photos. 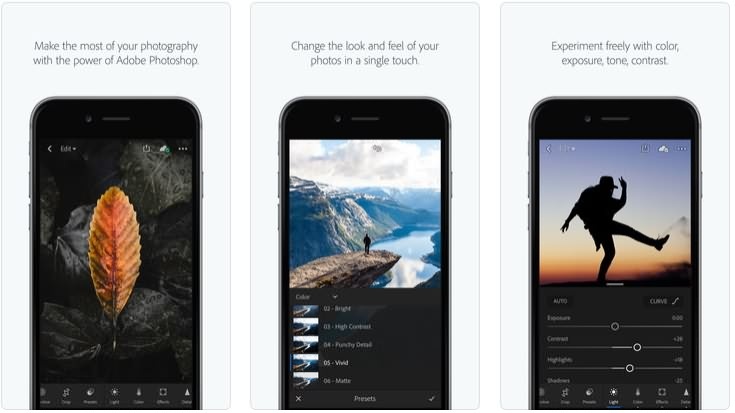 Each feature provided by this remarkably powerful app is very easy to use, so even if you don't feel confident in the role of the photo editor you'll have very little trouble using Snapseed. Advanced photo editors, on the other hand, will have a lot of fun using the HDR Scape, Double Exposure or Perspective tools that enable them to edit their images in a professional manner. 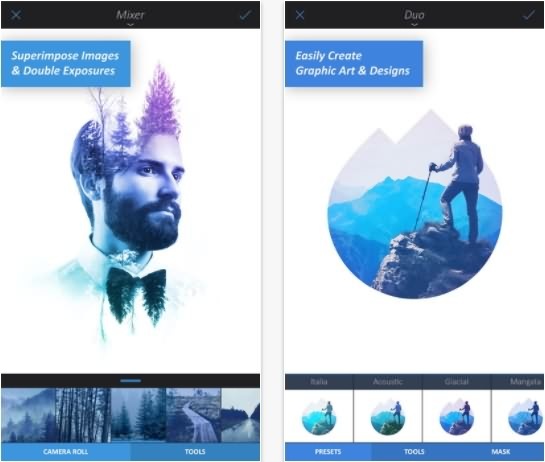 This stunning app has all the characteristics of a professional photo editing software because the features it provides allow its users to have complete control over the photo editing process. VSCO can be used to take photos with the front and rear cameras, while its advanced camera settings can be used to adjust Exposure, White Balance or even set the picture's focus manually. Editing photos with this app is both simple and fun because even the most advanced photo editing tools are easy to use. If you choose to install VSCO on your Smartphone you will become a part of a community that might help you improve your photographic skills. Pixelmator is much more than just a photo editing app since it also allows you to paint or design images. However, the photo editing tools it provides are more than enough to process photos you want to share on Instagram. This app lets you clone parts of the picture, distort images in a number of ways, while it makes the color correction process look easy. In addition to professional photo editing features, Pixelmator also offers a lot of photo filters and effects that can be easily applied to a photo. Support for a large number of picture file formats is also provided, which means that you can import images edited in Photoshop, into this app. 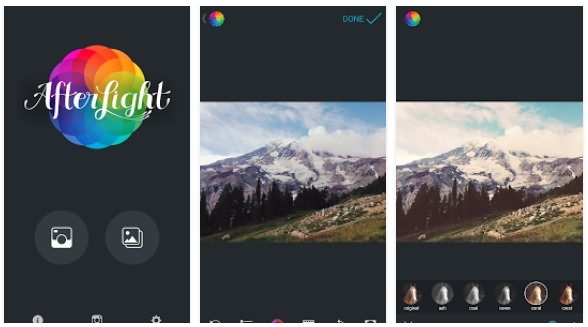 The fact that Enlight is the number 1 paid app in 121 countries speaks a lot about its popularity, but its features make it one of the top options for editing photos. If you want to create black and white photos, add an artistic touch to your pictures or create amazing collages, this all in one app can assist you. What's more, each tool offered by the Enlight app has a built-in masking that allows it to blend into a picture perfectly. This photo editor for iOS lets you share your photos directly from the app to any social media platform, including Instagram. Adobe Lightroom is considered to be one of the best photo editing programs ever created, and there is no reason to assume that the iOS or Android version of this photo editor is any less powerful. The all in one app lets you record videos or take photos, while it also gives you access to the HDR mode that automatically extends the exposure scope. Even though Photoshop Lightroom provides professional photo editing tools, the app is easy to use and it takes very little time to learn your way around this remarkable app that allows its users to create brilliant Instagram posts. This app is the photo filter heaven because it provides over 150 textures, nearly 30 photo editing presets and it enables you to create your own filters. 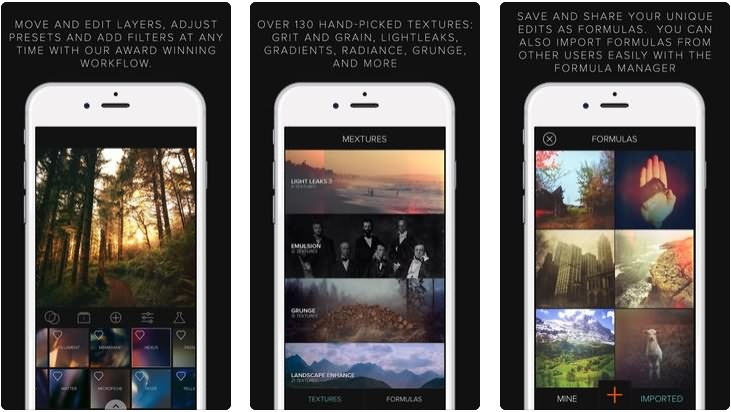 Mextures is a perfect choice for all iOS users that want to quickly edit their photos and share them on Instagram. In addition, the app lets you use an infinite amount of layers on your pictures, which means that you can combine as many filters and effects as you want. You don't have to be a photo editing expert in order to be able to use this iPhone photo editor, as a matter of fact, Mextures is so easy to use that even the people who know nothing about photography can create inspirational Instagram posts with it. Each cent you invest in the Afterlight app is a cent well spent since it will enable you to create images that will impress your Instagram followers. Even though the app can be downloaded for free, purchasing Instant Film Pack or Wander Pack that cost only $0,99 can help you produce photos that have a unique atmosphere which separates them from the sea of photos we can see on Instagram. In addition, the free version of Afterlight contains a lot of different textures and filters that can be applied to pictures with a single tap. Users of this app also have free access to 15 cropping presets which provide a fast way to create photos that match Instagram's aspect ratio. Presenting yourself in the best possible light can be a crucial factor in making your Instagram account a success, and an app such as Facetune will certainly help you create flawless selfies and portraits. 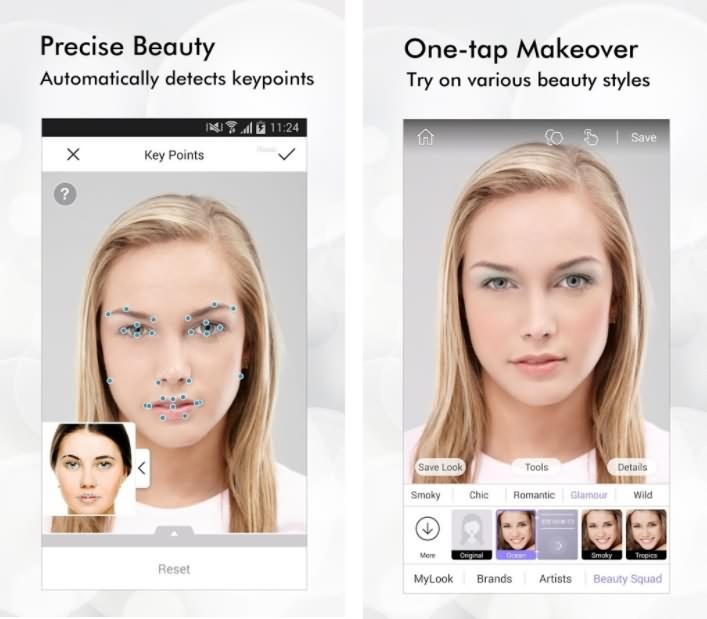 The app lets you beautify each detail of a face in just a few simple steps, and features like customizable filters or vivid makeup let you turn yourself and others into a work of art. Furthermore, you can improve your hairstyle, widen your smile or accentuate your eyes by easily applying effects that remove any imperfection from a photo. A number of photo filters provided by the Facetune app also let you enhance the colors in your photos. If you think that achieving perfection is impossible you should try using Perfect 365, because this virtual makeup app provides all the tools you'll ever need to create a flawless portrait. Instagrammers who are searching for the perfect look can experiment with more than 200 preset styles that can be applied to a photo with a single tap. Lipstick, shadow or teeth-whiting features are also available, while the app's color options ensure that each photo edited with this app meets the highest aesthetic standards. Despite its remarkable features, the free version of the Perfect 365 app, lacks some vital options that must be purchased, which makes using the app a little expensive. Combining text and images must be done skillfully or it might ruin your picture. 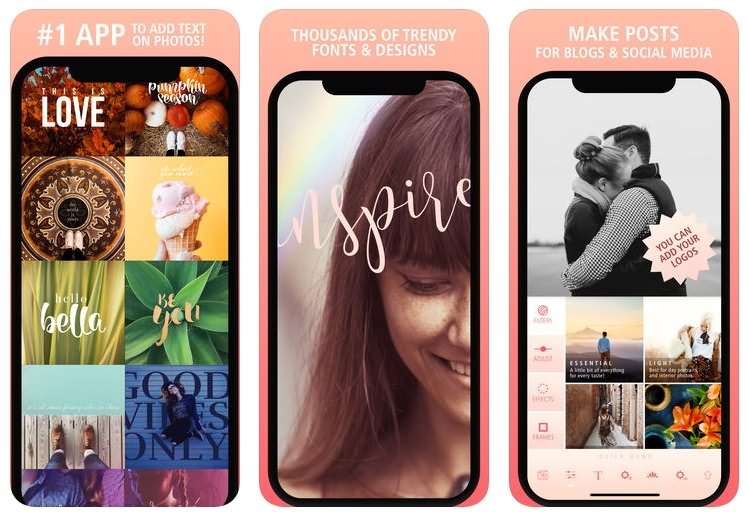 A powerful app such as Typic will provide you with the best tools available for adding text to photos, but these are just tools and you must find a perfect way to incorporate text into a photo. 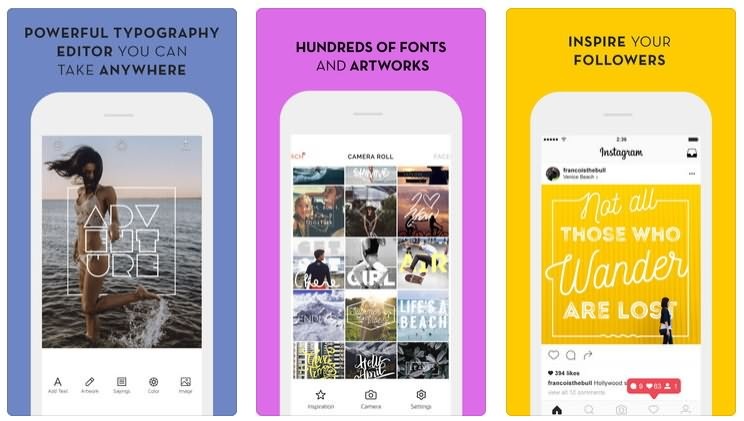 The app provides access to 165 different fonts, over 500 designed elements and nearly a hundred photo filters, which can all assist you in creating perfect Instagram posts. Typic also lets its users adjust RGB colors manually, and it allows them to export photos in square, portrait and landscape formats. A perfect tool for adding graphic design elements to your photos, that can be used effectively to enhance the colors on your pictures. Font Candy features a rich font library and it allows you to adjust the opacity of the font or to curve the text. Adding multiple text layers or animating text can help your Instagram photos get noticed and attract more followers. If you'd like to experiment with different artistic fonts or play around with text effects, you will feel like a kid in a candy shop, while using Font Candy. 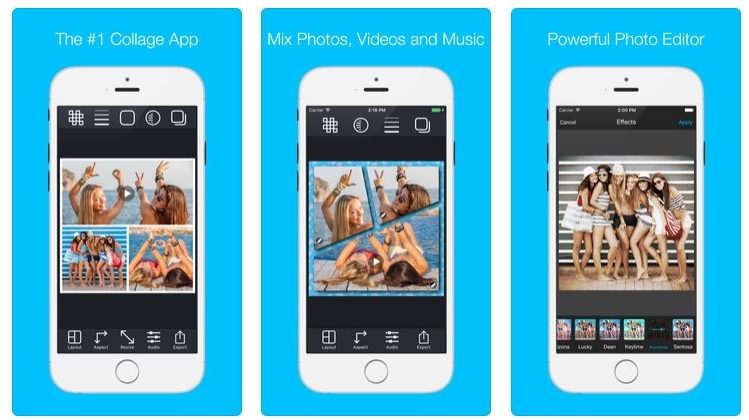 Stitch your photos or videos together with an app that offers over 300 different layouts. PicStitch app features a well-equipped photo editor that can perform almost any photo editing task you might have. In addition, the app's users can apply photo effects, rotate images or utilize the mirror effect. Combining several images into perfectly framed pictures is a quick process that won't take too much of your time, and you can also export your creations in 15 different aspect ratios. Despite the fact that you can download PicStitch for free, in-app purchases may be necessary if you want to use every option this app has to offer. 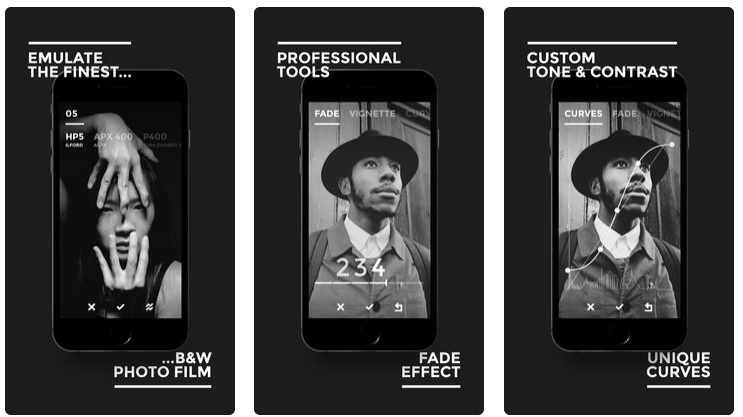 Analog photography admirers are going to have a lot of fun creating black and white images with this app because it provides countless ways to recreate the look of some of the iconic black and white films. Filters such as AGFA apx 400 or Kodak TRI-x 400 are just a few effects BLACK provides that will enable you to produce stunning black and white photos for Instagram. Fade, Vignette or Curves features expand the scope of possibilities provided by this app and they enable the app's users to create Instagram posts that look like they were taken with a professional camera. Professionals and photo enthusiasts can use the Camera Noir app with the same amount of efficiency since it provides the best black and white photography tools and it is extremely easy to use. Features such as Classic Film Stock Emulations or real 35 mm film grain will allow you to take your Instagram followers back in time. The app gives its users total control over the photo editing process because they can control contrast, luminance or clarity on each image they edit. 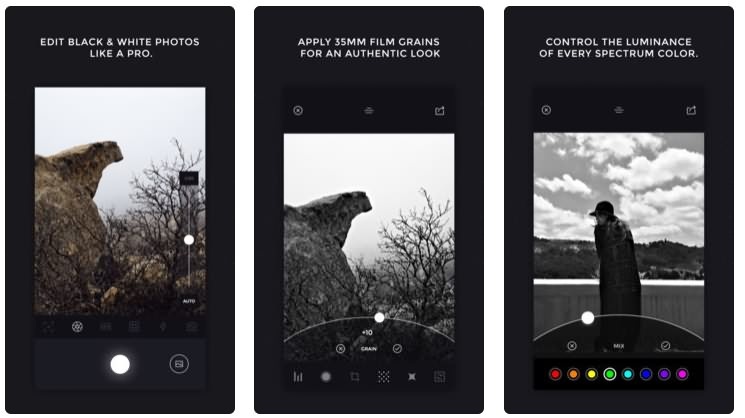 Unlike BLACK, Camera Noir also lets you take black and white photos and allows you to chose whether you want to adjust ISO, exposure and shutter speed manually or take your Instagram photos automatically. The best way to improve the performance of your photos on Instagram is to start taking better photos. ProCamera+HDR app offers almost the same options as a DSLR camera and it will allow you to expand the capabilities of your iPhone camera. This app lets you capture 4K and HD videos at frame rates that range from 24fps to 240 fps, while the app's Lowlight mode allows you to capture footage even in very dark rooms. Like most DSLRs this app lets its users capture RAW and TIFF files in addition to JPEGs that can be edited with powerful photo editing tools this app provides. 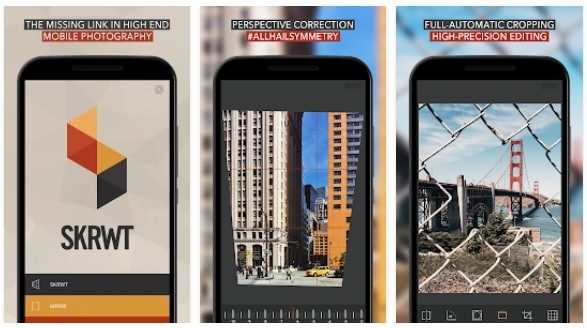 SKRWT is a lens and perspective correction tool that doesn't provide any other photo editing features. Taking photos with this app is not an option, but correcting any kind of imperfection created by a lens is an easy job. This app is best suited for improving the images taken with GoPro cameras or wide angle lenses that curve objects depicted in a photo. A few extensions that broaden the range of the app's photo editing features can be purchased for $0,99. 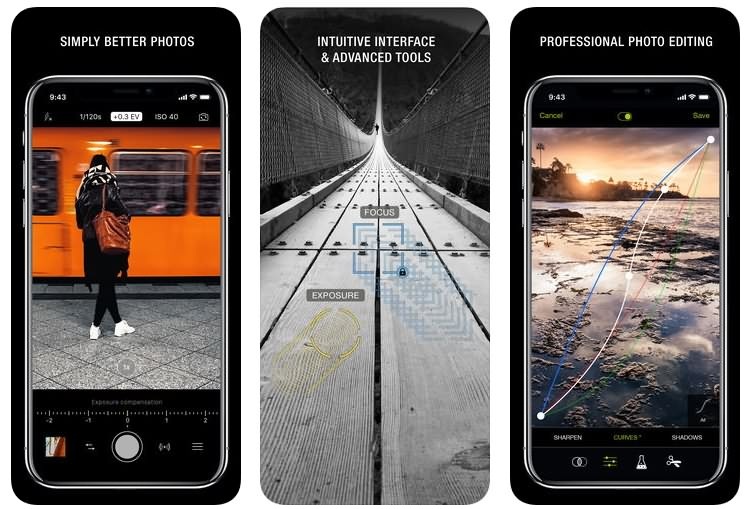 Despite the fact that SKRWT is a remarkable app, it is designed to perform a specific job and it offers almost nothing outside superb lens correction tools. Creating a successful Instagram post demands much more than just hitting the share button, and if you want each photo you post on Instagram to be a success, consider using photo editing apps that will allow you to enhance your pictures. Choose only the apps you feel comfortable with because there is no point in using an app that allows you to set the exposure or shutter speed manually if you never heard of these terms before. Regardless of the skill level, you might have, taking and editing a lot of photos each day will help you create better photos for your Instagram account.